Dog Days at the Library! You may have heard the famous Groucho Marx quote- "Outside of a dog, a book is man's best friend. Inside of a dog, it's too dark to read." At St. Tammany Parish Library, we are putting dogs and books together with Love on a Leash and Read to a Pup. Children ages 5-9 visit their library at certain time to practice reading out loud to a dog and the dog's handler. 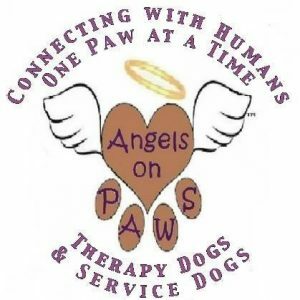 The dogs are screened and trained therapy dogs affiliated with Love on a Leashopens a new window and Angels on Pawsopens a new window. There has been a lot of research in the past few years on the positive effects on reading fluency and confidence when children practice reading aloud to dogs. Animals don't judge! The dogs are interested in interacting with the children and appear to be patient listeners. The handler gives gentle help when a child might stumble on a word. Parents wait away from the reading so the child is focused on the book at hand, and the dog. Of course there is time after the 15 minute session for pets, treats and photos. Abita Springs Branchopens a new window- Registration opens 1 week prior to the event. Call 985-893-6285 to register for a time slot. Lacombe Branchopens a new window- Registration opens 1 week prior to the event. Call 985-882-7858 to register for a time slot. Madisonville Branchopens a new window- Registration opens 1 week prior to the event. Call 985-845-4819 to register for a time slot. Mandeville Branchopens a new window- Registration starts 4 weeks in advance. Call 985-626-4293 to register for a time slot. Slidell Branchopens a new window- Call 985-646-6470 to register for a time slot. Registration starts on the first of each month. South Slidell Branchopens a new window- Call 985-781-0099 to register for a time slot. Registration starts on the first of each month.